Women are asking themselves this question more and more these days. As the economy tanks and the cost of living sky rockets, we are trying to find more streams of income to help support our families. Gone are the days where the wife can stay home comfortably while the husband works 9-5 every day. We are all trying to find ways to supplement our husband’s incomes. We look at our bills and our incoming cash flow and fret about how we are going to make ends meet each month. More than ever, I am seeing more wives trying to be strategic in finding some way to help bring more money into the home. Perhaps I was oblivious to it as a child but it seems to be the norm in this day and age. Have you noticed? We may find ourselves saying that we need to make more money but many times we get stuck there. We don’t move forward with a plan. We are all talk with no action. Or maybe we do try to think of some ideas but we get stuck there. We can’t brainstorm good ideas so we throw in the towel too early. There is another big road block stopping us from making money from home. Ourselves. We are our own worst enemy. We critique ourselves more than anyone else. We shoot down our own ideas before they even have a chance at coming to fruition. We mull things over and over again without ever taking the plunge. Fear keeps us captive. Can you relate? I think we all can relate. Whether you are already making money from home or trying to find a way to make money from home, fear still lurks tempting you to quit. In the book, Money Making Mom , Crystal Paine walks you through all of these key issues that are holding you back. This book is the go to resource for women who want to put their ideas into action. We can talk all day long about wanting to make money from home but we need step out of our comfort zone and do it! What I love about this book is it not only takes you through the processes of starting to make money but that Crystal holds your hand through each step, from the initial brainstorming to actually implementing that idea. One of the hardest things to do is to come up with the actual ideas. Sometimes our creative juices just don’t want to flow. Or maybe we aren’t creative enough to think of anything. It’s super easy to want to throw your hands up and give up. If you can’t even think of an idea how can you even be successful, right?? What’s makes Money Making Mom such a great resources is that Crystal starts that brainstorming session for you. Throughout each step she gives you a running list to get you going. She is invested at helping you find your passion. She doesn’t just tell you to go write down your interests and come back to the book when you’re done; she gives you various ideas to get you started. I love that! She becomes your cheerleader and your truth teller. She doesn’t sugar coat that this process will be hard in the beginning. She doesn’t deny that there will be times when you will want to quit. But she encourages you to make slow, steady progress. It is important to keep showing up day in and day out, and to let your passion fuel your determination in those hard times. Crystal teaches that financial freedom isn’t just about making more money for your own interests or for that next coolest gadget that came on the market. There is no fulfillment or satisfaction in those things. We will always be spinning our wheels trying to get ahead with this way of thinking. The most important aspect of making money from home is to have vision bigger than yourself. She encourages you to have a vision that leaves an impact on your community, on your missionaries, or on the charity that you have a passion for. This is where you will find true financial freedom. Many of readers who are real life friends know that my husband and I own our own independent pharmacy. While times are tough and new start ups are not an easy season of entrepreneurialism to go through we are committed to our bigger vision. My husband and I would love to help pay off our church’s mortgage at a quicker rate, to fund mission trips for those who can’t afford to go, to go on mission trips as a family or serve in a paid position without being paid to lighten the church’s financial load. So on the hard days while we wait for the break even point, we go back to our why, why did we start this thing? When you go back to your why, when you go back to your bigger vision you are able to get through those rough times. Ladies, we can make an impact. We can help our families finances. We can move from our tough financial position and propel ourselves forward and Money Making Mom will help you do just that. So if you’re like most other women today, wondering how you can make money from home, do yourself a favor and pick up this book and start putting your idea into motion. Your turn! Do you a desire to make extra money from home and don’t know where to start? Do you have at home business adventure to share with us? I’d love to hear! Thank you so much Melanie for you encouragement! This just made my morning, you are the sweetest. Heading over to see who else is on your list. 🙂 Thanks again Melanie! It is an awesome resource for women, Rose. I hope you can get your hands on a copy soon! Thanks for visiting this morning! So funny! We are all super excited to share why we love this book! It is a great resource for the modern day women. Hi Ana, That sounds like a book I’d enjoy reading. I agree that it’s getting harder and harder to make ends meet. We spent quite a few years overseas and I couldn’t believe how prices had gone up on everything each time we came home. I’ve tried a lot of ways in the past to help out with expenses. We did baking one summer which was pretty profitable, but a lot of work. I love to sew, so I’ve considered pursuing that. Actually my sister and I are working on something right now, so we’ll see where that goes. Right now we’re selling Plexus Health Products. They have a lot of great products that have real results. I wrote about it here. I the prices were a big shock! It seems like everything is going upward in price fairly consistently these days. I hope your new business adventure takes off for you is successful! You guys should definitely grab this book. There is so much wisdom, advice and motivation in it to get you started and to keep you going! You mentioned that you don’t remember wives being so desperate to bring money into the family when you were a kid. I wonder if this was because the economy was stronger or if there is a difference in our mindset today? Perhaps families today are trying to keep up with the Joneses, so to speak? It’s something to consider. Thanks for sharing about the book. It sounds like a good one! Ohhhh good thought provoking question! I do wonder if our mindset has shifted as well. Especially with the feminist movement in full force and coveting what our neighbor has instead of being content. I do believe the poor economy has a strong pull in our decision as well. Eggs didn’t used to cost $3 a carton!! Everything is on the rise! I love how you are empowering women! WAY TO SHARE THE LOVE! I LOVE the part about really having a larger vision for your business. I’ve always said I couldn’t “sell people stuff.” I couldn’t just sell products. Earlier this year, after my fifth baby, I could NOT get my energy back, my weight was steadily climbing, and my joints ached. I was always sluggish and would homeschool from the bed. Then, a friend recommended Thrive from a company called Le-Vel…it has TOTALLY changed my life. And I HAD to become a promoter because after doing research, I realized it was changing A LOT of people’s lives. Furthermore, now that we’ve seen how profitable the business can be, our vision is to make enough to become local missionaries. We’re EXCITED about helping people!! I also appreciate that the company will give anyone (customers and promoters) their products for free with 2 referrals. We could NOT have afforded it otherwise. We were a 1 income family of 7!! My dad payed for the first month and it’s been free ever since!! Such an awesome story! That was so sweet of your father to help you guys out with the initial fee. I love hearing stories of success. This book is filled with success stories that will inspire women. thanks for sharing our story with us, Alissa! Thanks so much for this review. I went through Crystal’s Morning Makeover course and it was very helpful and inspiring. I’m really thinking about purchasing her book, it was nice to get your feedback on it. I really struggle sometimes with my motivation. It’s hard being career minded and then switching to a SAHM homeschooling and not having any impact on the family’s finances. I don’t want to get rich or anything, it would just be nice to, say, help buy groceries once an awhile 🙂 Thanks again for posting! I love the Make Over Your Mornings course! I plan on doing it again at the start of the new year! I think I’m going to blog it this time around for the accountability! 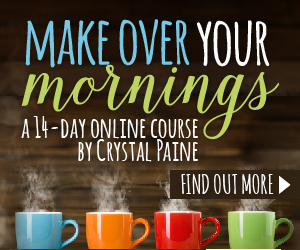 Crystal is so inspiring so if you enjoyed her course you will love her book. I struggle as well, our men work so hard to make ends meet and sometimes its just barely enough. Finding a way to be a small help in that area can make all the difference. So glad you stopped by tonight!